CAMBRIDGE, United Kingdom, 24 October 2017 – UltraSoC today announced that Professor Alberto Sangiovanni-Vincentelli has joined the company as Non-Executive Chairman, bringing the benefits of his significant experience in the electronics design industry. The appointment comes as UltraSoC drives accelerating adoption of its IP for debug during chip design, and of its embedded intelligent analytics capabilities for monitoring wider system performance on all processor platforms: in particular the open-source RISC-V architecture. UltraSoC’s technology is now enhancing safety, security and power for system design, in applications including automotive, enterprise IT, and the Internet of Things (IoT). 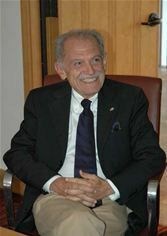 Sangiovanni-Vincentelli, an electronics industry luminary, joined the company’s Strategic Advisory Board in June of this year. It was immediately clear to the Board that UltraSoC could benefit significantly from his experience and his vision for the system-wide potential for the company’s technology. Sangiovanni-Vincentelli replaces outgoing Chairman, Chris Gilbert, who steps down having served as UltraSoC’s Chairman since January 2014. Sangiovanni-Vincentelli is a major figure in both commercial and technological developments in the electronics industry and brings significant experience of direct relevance to UltraSoC and its applications and development of its technology. In the 1980s, Sangiovanni-Vincentelli helped to found both Cadence Design Systems and Synopsys – the two industry leaders in Electronic Design Automation (EDA). He has also fulfilled many advisory roles, ranging from Intel, HP and ST microelectronics in the semiconductor industry to General Motors and UTC in systems. A distinguished academic, Professor Sangiovanni-Vincentelli has been with the Department of Electrical Engineering and Computer Sciences, University of California, Berkeley, since 1976. He is also an author of 950 papers, 19 books and 2 patents, and a recipient of numerous academic and industry awards with plaudits referring to his “pioneering contributions to EDA” and “ground-breaking contributions that have had an exceptional impact on the development of electronics and electrical engineering or related fields”.